If you're wondering how Modern Warfare 3 will improve your gamer score, then look no further. The full list of Call of Duty: Modern Warfare 3's achievements - and presumably trophies as well - has found its way online. The list is fairly spoiler-tastic, but it does contain some interesting tidbits of information about the game's story and the challenges the player will face. As you might expect, there are plenty of gamer score points on offer for completing the game's story missions, and even more for completing them on higher difficulties. 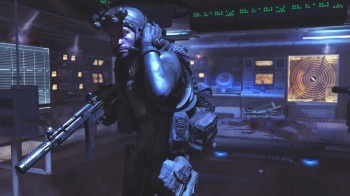 There are also points to be had for completing tasks in certain ways or performing particularly well in certain missions, and for playing the game's revamped Special Ops mode. â€¢	Back in the Fight - 5G: Start the Single Player Campaign on any difficulty. â€¢	Too Big to Fail - 10G: Destroy the Jamming Tower. Complete "Black Tuesday" on any difficulty. â€¢	Wet Work - 10G: Take back New York Harbor. Complete "Hunter Killer" on any difficulty. â€¢	Carpe Diem - 10G: Escape the mountain safe house. Complete "Persona Non Grata" on any difficulty. â€¢	Frequent Flyer - 10G: Defend the Russian President. Complete "Turbulence" on any difficulty. â€¢	Up to No Good - 10G: Infiltrate the village. Complete "Back on the Grid" on any difficulty. â€¢	One Way Ticket - 10G: Make it to Westminster. Complete "Mind the Gap" on any difficulty. â€¢	Welcome to WW3 - 10G: Save the US Vice President. Complete "Goalpost" on any difficulty. â€¢	Sandstorm! - 10G: Assault the shipping company. Complete "Return to Sender" on any difficulty. â€¢	Back Seat Driver - 10G: Track down Volk. Complete "Bag and Drag" on any difficulty. â€¢	We'll Always Have Paris - 10G: Escape Paris with Volk. Complete "Iron Lady" on any difficulty. â€¢	Vive la RÃ©volution! - 10G: Reach the church. Complete "Eye of the Storm" on any difficulty. â€¢	Requiem - 10G: Escape the city. Complete "Blood Brothers" on any difficulty. â€¢	Storm the Castle - 10G: Discover Makarov's next move. Complete "Stronghold" on any difficulty. â€¢	Bad First Date - 10G: Find the girl. Complete "Scorched Earth" on any difficulty. â€¢	Diamond in the Rough - 10G: Rescue the Russian President. Complete "Down the Rabbit Hole" on any difficulty. â€¢	The Big Apple - 25G: Complete "Black Tuesday" and "Hunter Killer" on Veteran difficulty. â€¢	Out of the Frying Pan... - 25G: Complete "Persona Non Grata", "Turbulence", and "Back on the Grid" on Veteran difficulty. â€¢	Payback - 25G: Complete "Mind the Gap", "Goalpost", and "Return to Sender" on Veteran difficulty. â€¢	City of Lights - 25G: Complete "Bag and Drag" and "Iron Lady" on Veteran difficulty. â€¢	The Darkest Hour - 25G: Complete "Eye of the Storm", "Blood Brothers", and "Stronghold" on Veteran difficulty. â€¢	This is the End - 25G: Complete "Scorched Earth", "Down the Rabbit Hole", and "Dust to Dust" on Veteran difficulty. â€¢	Who Dares Wins - 40G: Complete the campaign on any difficulty. â€¢	The Best of the Best - 100G: Complete the campaign on Hardened or Veteran difficulty. â€¢	Strike! - 20G: Kill 5 enemies with a single grenade in Single Player or Special Ops. â€¢	Jack the Ripper - 20G: Melee 5 enemies in a row in Single Player or Special Ops. â€¢	Informant - 20G: Collect 22 Intel Items. â€¢	Scout Leader - 35G: Collect 46 Intel Items. â€¢	This Is My Boomstick - 20G: Kill 30 enemies with the XM25 in "Black Tuesday." â€¢	What Goes Up... - 20G: Destroy all the choppers with only the UGV's grenade launcher in "Persona Non Grata." â€¢	For Whom the Shell Tolls - 20G: Destroy all targets during the mortar sequence with only 4 shells in "Back on the Grid." â€¢	Kill Box - 20G: Kill 20 enemies with the Chopper Gunner in a single run in "Return to Sender." â€¢	Danger Close - 20G: Take down a chopper with an AC-130 smoke grenade in "Bag and Drag." â€¢	Nein - 20G: Kill 9 enemies with A-10 strafing runs in "Scorched Earth." â€¢	50/50 - 20G: Complete a Special Ops Mission Mode game with the same number of kills as your partner. â€¢	Birdie - 20G: Kill 2 enemy helicopters without getting hit in a Special Ops Survival game. â€¢	Serrated Edge - 15: Finish a Juggernaut with a knife in Special Ops. â€¢	Arms Dealer - 20G: Buy all items from the Survival Weapon Armory. â€¢	Danger Zone - 20G: Buy all items from the Survival Air Support Armory. â€¢	Defense Spending - 20G: Buy all items from the Survival Equipment Armory. â€¢	Get Rich or Die Trying - 25G: Have $50,000 current balance in a Special Ops Survival game. â€¢	I Live - 10G: Survive 1 wave in a Special Ops Survival game. â€¢	Survivor - 20G: Reach Wave 10 in each mission of Special Ops Survival mode. â€¢	Unstoppable - 40G: Reach Wave 15 in each mission of Special Ops Survival mode. â€¢	No Assistance Required - 20G: Complete a Special Ops Mission Mode game on Hardened or Veteran with no player getting downed. â€¢	Brag Rags - 10G: Earn 1 star in Special Ops Mission Mode. â€¢	Tactician - 20G: Earn 1 star in each mission of Special Ops Mission Mode. â€¢	Overachiever - 40G: Earn 48 stars in Special Ops Mission Mode. â€¢	Secret Achievement - 20G: Continue playing to unlock this secret achievement. If you've made it down this fair, you've probably noticed that the list isn't entirely complete; there's one secret achievement on the list with no indication as to what it might be. Hopefully, it will be for something really bizarre or obscure, like carrying a garden gnome through the whole game, or something similarly strange.